Boris Nemtsov, shown here shaking hands with Vladimir Putin, was murdered yesterday (shot in the back four times in broad daylight) less than 200 meters from the Kremilin and Red Square. Mr. Nemtsov, - a scientist and statesman, was also a successful politician under Boris Yeltsin. 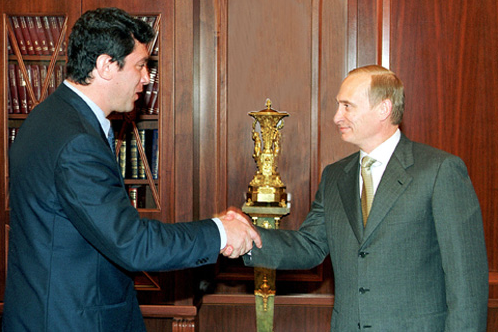 Since 2000, Nemtsov had been an outspoken critic of Vladimir Putin. Mr. Nemtsov was in Moscow helping to organize a protest against Mr. Putin's policies regarding Russia's involvement in the Ukraine War. This image was taken in July of 2000. Some may erroneously describe Putin's facial expression as a partial smile - however Vladimir's "false smile" is harboring a high degree of disgust. Note his considerable mid-face tension - more specifically the flaring of his nostril (only left on is visible), the tightening and narrowing of his upper lip and the primarily lateral-vectoring of his mouth corner (as opposed to upwards as it is with a sincere smile). His chin also displays dimpling. Look at Putin's lower face in this picture for ten seconds. What emotion do you feel?